News and views of Constance Cumbey concerning "Radical Middle", New Age Movement, Communitarianism, "planetary humanism," "global governance," European Union, Javier Solana, Jeremy Rifkin, "New Age Politics," law in the USA, combined with life in general -- sometimes humorous, sometimes not! While accomplishing other work, I attended the expensive Davos "by invitation only" conference "the poor man's way: I watched the 2011 speeches which are already up on YouTube. Klaus Schwab obviously is doing a masterful job of schmoozing heads of state and corporate entities. The theme of this year's World Economic Forum is "Global Risks 2011." The two most pressing "risks" per the materials for participants are "economic disparity" and "global governance failure." Heads of state are getting figurative stars pasted on their foreheads for making the most innovative statements on how to steer all in that direction. A common theme is "shared values." Russian President Medvedev, obviously shaken by the recent terrorist attacks at the Moscow Airport spoke about the shared common values we would need for the "wonderful new world" we were building. He specifically incorporated "religious differences" as a major factor causing societal divisions. He had kind words, however, about Russian ally Iran. The two "systemic risks" of "failure of global governance" and "economic disparities" are, per the report, connected to the other 35 "identified risks." Both our "JD" and "Rich of Medford" will find much of interest in the proceedings and materials available on line for analysis. One cannot help but wonder if Maurice Strong's "collapsing the global economy" to achieve "global unity" fantasy of 1990 might be happening before our very eyes, not to mention the prophesied events of the biblical books of Daniel, Ezekiel and Revelation. It would be well worth your time to go to YouTube and do a search using the terms "World Economic Forum" and "2011." Besides, its lots cheaper than the airfare, hotel room, encountering the security and probably not getting in at all. Apologize that the great buffets and wining/dining perks won't be there. Maybe you can take your own snacks from the refrigerator! FBI INVESTIGATION NEEDED -- MY ENTIRE GOOGLE ACCOUNT WAS HI-JACKED AND EMPTIED! HALLELUJAH UPDATE: Regained control of gmail account, approximately 4 a.m. this morning, primarily thanks to those of you putting me onto how to check filters for forwarding information! IT IS NOW SAFE TO RESEND FORMER EMAILS TO ME AND PLEASE DO SO! U P D A T E: PLEASE DO NOT SEND TO THE CUMBEY@GMAIL.COM ADDRESS UNTIL FURTHER NOTICE. THE HIJACKERS STILL HAVE FULL CONTROL OF IT. THE ONLY MAIL COMING TO ME IS WHAT I SEND MYSELF FROM THE GMAIL ACCOUNT. EVEN ALTERNATE ACCOUNT MAIL IS NOT REACHING ME. THIS IS AN ONGOING CRIMINAL ACT WHICH APPEARS TO BE EMANATING FROM EUROPEAN SOURCES! I MAY BE REACHED BY PHONE AT 248-253-0333. MANY THANKS TO SO MANY OF YOU WHO CALLED AND EXPRESSED CONCERN. MANY THANKS TO JOE McNEILL AS WELL WHO HAS BEEN ACTIVELY WORKING WITH ME TO CATCH THE PERPETRATORS! THANKS TO DOROTHY FOR HER PROMPT OBSERVATION AND POSTING! This morning I arose unusually early. The Lord probably woke me. My entire Gmail/Google Account was hijacked. Somebody had changed my password and TOTALLY EMPTIED everything. I had priceless information in it -- upwards of 7 gigabytes of stored memory. The same criminal perpetrator/perpetrators sent messages to all on my email lists or with whom I had ever corresponded that I was stranded in London and needed money for rescue. For the record, I AM NOT IN LONDON, NOR HAVE I EVER BEEN THERE! The IP address of the perpetrator is traced to near Edinburgh, Scotland and it emanates from a blackberry user. What needs immediate rescuing is my email. I am asking all who corresponded with me to retrieve as many messages sent from me or to me to my email address of cumbey@gmail.com to resend them for now to my Constance_Cumbey@msn.com. Also, please send copies to my alternate account of cumbey@yahoo.com. Whoever did this committed a felony. I hope they are prepared to face the music! Not exactly sure what this means, but protection of Christian Communities is needed! After some rather obvious anti-Christian moves and under heavy criticism, the European Union and Catherine Ashton have given at least some lip service to the issue of persecution of Christian communities. Exactly what either the sincerity or the motives are, I am not prepared to say at present, but that protection is needed is obvious. Another question occurring to me: will any "protections" be added to the arsenal of the Alliance of Civilizations that could result in further repressions down the road of religious fundamentalism/orthodoxy? EU High Representative for Foreign Policy Catherine Ashton promised action to protect religious minorities and in particular Christian communities, seeking to assuage critics of her alleged lack of engagement in this matter. "Long-established Christian communities in the Middle East face difficulties, which have led to significant displacement in some countries and dwindling numbers in the region as a whole. The EU will not turn a blind eye to their plight," she said, addressing a plenary session of the European Parliament in Strasbourg. Ashton pledged increased attention from EU delegations across the world regarding cases of intolerance, even before they trigger actual violence. However, she did not divulge details of possible changes to EU foreign policy instruments in order to better guarantee protection for Christians. Like S&D MEPs, she was keen to underline that intolerance and hatred concern all religious minorities, not just Christian communities. As a concession to requests from many centre-right MEPs, she promised to analyse clauses in trade deals to encourage more stringent implementation of human rights. 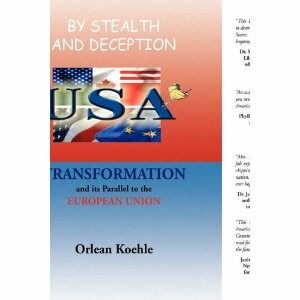 "I will look into GSP (Generalised System of Preferences) regulation," she said, but that dossier mainly falls under the remit of EU Trade Commissioner Karel De Gucht. Ashton also promised further discussions on the protection of religious minorities in the next EU Foreign Affairs Council and at the United Nations. "We are considering another initiative to rally strong cross-regional support on this theme in the forthcoming session of the UN Human Rights Council in March," she said. Her engagement is expected to temporarily mitigate the criticism of Christian MEPs who are at odds with certain recent initiatives from the European Commission that are seen as anti-Christian. 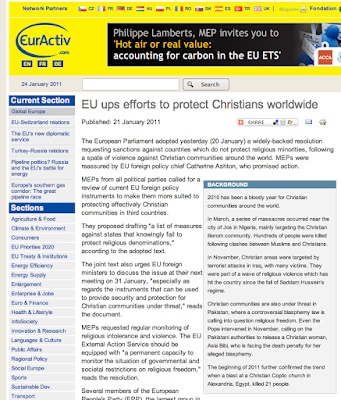 During the debate with Ashton in the Parliament, many MEPs from the EPP and the ECR (European Conservatives and Reformists) groups reiterated their condemnation of the failure to mention any Christian festivities in the EU diary for 2010/2011. The diary, of which over three million copies have been produced, has been widely distributed among EU teachers and citizens. But it does not include Christmas or Easter in its calendar, while it mentions European festivities and the celebrations of other religions. BRUSSELS (AFP) - EU foreign policy chief Javier Solana hit back at criticism from Serbs after violent riots erupted in Kosovo, saying the international community was not to blame for the flare-up. Solana, speaking a day after he was jeered by displaced Serbs during a visit to the UN-run province, said: "I would not say that it is a failure of strategy of the European Union (news - web sites). "I think it is a failure of the behavior of the people of Kosovo. We are not responsible for the behavior of the people of Kosovo," he told reporters. "We have expended capital on Kosovo more than any other place in the world. The blame should not be put on the international community. I think the blame has to be placed on the people who have not been able to organize themselves." During a visit to Kosovo Wednesday, Solana faced abuse by displaced Serbs demanding to know why the international community did not intervene until well after the three-day rampage by the ethnic Albanian majority began. On Thursday, he accused local political leaders of exploiting the Albanian mobs to their own advantage. "(The violence) was not completely spontaneous. There were already a lot of people organized to take advantage of that moment of spontaneity," he said, speaking shortly before the start of an EU summit. "That is something which is very serious because those people who were already organized probably belong to a political party with heavy responsibilities. The leaders of that party have to come out and say very clearly and very strongly that this is not possible," he said. The violence, which erupted on March 17, killed 28 people and left a trail of destruction through Serb areas of Kosovo. Thirty Serb churches and monasteries were torched, seven villages were razed and 3,600 people were made homeless. Read the full story about the EU's apparent new found stance against persecuting Christians by clicking here. What if you were in a coma? Would you want to be presumed "brain dead" or a "vegetable"? I met Greta Emling, the wonderful author of the equally wonderful Wounded, Trapped, and Voiceless, at a wedding reception a little less than a month ago -- on December 18th, to be precise. She was already acquainted with my husband, Barry. She had heard I was also an author and wanted to meet me. I downloaded her book to my Amazon Kindle on the spot. It turns out my husband already had a copy of the hard copy book she had given him as a gift sometime earlier. This was a book I could hardly put down. I had a case as a lawyer involving very similar issues several years earlier. In that case I obtained a restraining order against a prominent Detroit, Michigan area hospital and one of its physicians from "pulling the plug" on a man in very similar circumstances. Watch the video clip above to meet both the author and the subject of the book. 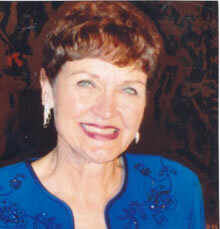 I am blessed to have Greta Emling as my radio guest tomorrow night, 7 p.m. Eastern time, 4 p.m. Pacific time on my internet radio program, "My Perspective" at "themicroeffect.com." How it was detected that the alleged "vegetable," was awake, heard every word, but was trapped in her own body as a result of a condition known as "slow brain bleed" is vital for all of us who might one day become either trapped in our own bodies and/or have loved ones that are. We might need to be the advocate for such a loved one or have a loved one be one for us. This book and this subject are important. Please join us Tuesday night on MY PERSPECTIVE internet radio! Tune in and stay tuned! 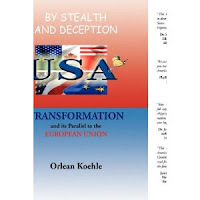 California Eagle Forum president Orlean Koehle has written an important, well documented book: BY STEALTH AND DECEPTION: USA Transformation and its Parallel to the EUROPEAN UNION. She has also led a battle against "Smart Grid" in the State of California. I found on the internet yesterday, that evidently her battle had caused the utility company no small degree of consternation. We will be discussing both her book and the Smart Grid issues on MY PERSPECTIVE internet radio Thursday night, 4 p.m. California time, 7 p.m. Eastern time. Please plan to join us and call in with your questions to 888-747-1968. Tune in then and stay tuned! 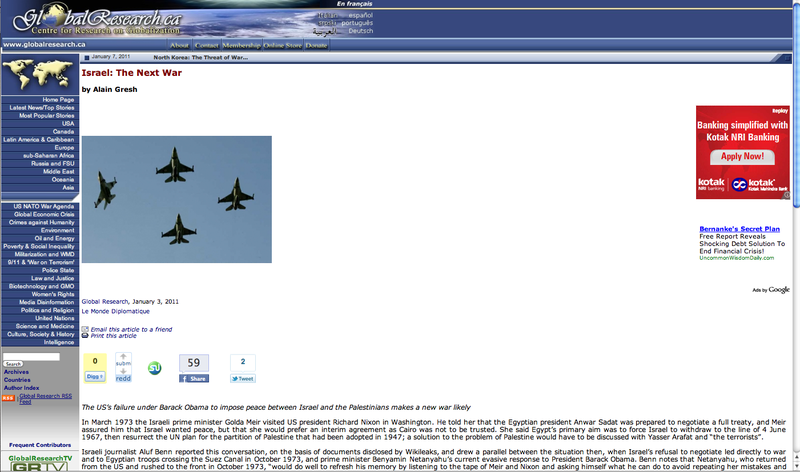 This story appearing today, January 7, 2011, on Global Research, C.A. 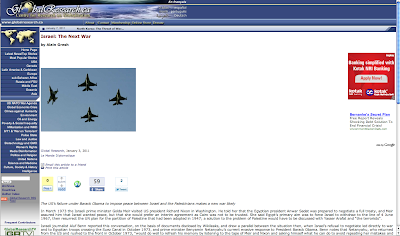 's website originally appeared in Le Monde Diplomatique on January 3, 2011. ". . . The US’s failure under Barack Obama to impose peace between Israel and the Palestinians makes a new war likely . . . "
Read the whole story by CLICKING HERE. "Israel’s refusal to accept Obama’s proposal to halt settlements on the West Bank (but not in East Jerusalem) for three months in return for unprecedented promises – or bribes, according to columnist Thomas Friedman (2), who is not known for sympathy to the Arabs – confirmed that Obama is unable to exert any real pressure on Israel and that Netanyahu rejects any compromise. Netanyahu, like his predecessors, claims to want peace but he wants the humiliating peace imposed by conquest and based on denial of Palestinian rights. In secret negotiations over the past year, he has repeatedly told the Palestinians they had to accept Israel’s “security concept”, keeping Israeli troops stationed in the Jordan valley along the “barrier” (on the Palestinian side) and the occupation of a substantial part of the West Bank (3). He did not say how long the occupation would last. "This deadlock is forcing the Israeli army to draw up plans for further wars based on the “security concept” – that anyone who refuses to accept Israel’s rule in the region is a “terrorist” to be eliminated. No other country, not even the US, has such a comprehensive security concept, which means that Israel is permanently at war. Who will the Israeli army attack next? Gaza? Two years ago Israeli tanks and aircraft reduced buildings to rubble and killed hundreds of civilians in what the Goldstone report describes as “war crimes” and probably “crimes against humanity”. But Hamas is as strong as ever. How long will Israel tolerate this? Lebanon? In July-August 2006, the Israeli army failed to bring down Hizballah but succeeded in destroying the country; Hizballah is now stronger than ever and the Israeli high command cannot rule out the possibility of a major operation and occupation of part of Lebanon (4). Iran? At the risk of starting a major conflict from Iraq to Lebanon, Palestine to Afghanistan?In the Middle East unrest inevitably leads to war. This time, unlike 1973, Israel would take the first direct step, but it will face far more effective enemies and, as Israeli peace campaigner Uli Avnery points out, the hostility of world public opinion (5). Brazil, Bolivia and Argentina have recognised the Palestinian state within the pre-1967 borders and there has been a letter from 26 European elder statesmen (including Chris Patten, Giuliano Amato, Felipe Gonzáles, Lionel Jospin, Hubert Védrine, Romano Prodi, Javier Solana), who are anything but extremists, calling on the European Union to impose sanctions if the Israeli government has not reviewed its policy by the spring. Human Rights Watch published a report on 19 December (Israel/West Bank: Separate and Unequal) about the systematic discrimination against Palestinians, calling on the US government to withhold US funding from the Israeli government equivalent to expenditure on settlements (more than $1bn). And in that day will I make Jerusalem a burdensome stone for all people: all that burden themselves with it shall be cut in pieces, though all the people of the earth be gathered together against it. This Associated Press article appearing today on the Minneapolis-St. Paul Star Tribune website reveals a bloody and violent start for 2011. It will also no doubt be great grist for the Alliance of Civilizations mill. 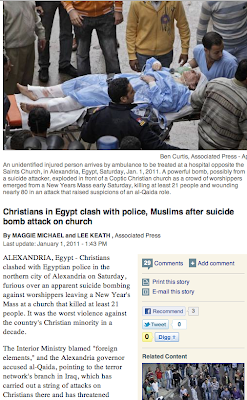 Undoubtedly, "religious fundamentalism" will be blamed for both sides of this horrific episode. Stay tuned and 'Happy New Year'. As an active Michigan lawyer, I practice my profession primarily in Macomb, Oakland and Wayne counties of Michigan, USA (248-253-0333). Sometimes I do work in my old "stomping grounds" of our State Capitol, Lansing, Michigan on administrative, state law related matters, as well. I've enjoyed active and stimulating careers in government, politics, law and as a published and translated author. In the past, I have worked for the Michigan House of Representatives, the Michigan State Senate, and the City of Highland Park, Michigan. I'm the author of the first major critical book about the New Age Movement, THE HIDDEN DANGERS OF THE RAINBOW: The New Age Movement and our Coming Age of Barbarism (1983); A PLANNED DECEPTION: The Staging of a New Age Messiah (1986). Currently, I'm completing a volume about Javier Solana, the Barcelona Process, Israel and the European Union. Email me cumbey@gmail.com. LEE PENN, AUTHOR OF "FALSE DAWN"